LightKeeper Pro… Does this really work? Can sending a pulse through the light set fix bad bulbs? Houston-Luxury-Lughting.com put this product to the test and the results are quite surprising. Well the days are drawing fewer for Christmas and we’re all digging through delicate strands of lights that we’ve not seen in 360 or days with the hopeful expectation that they still work. All while forgetting the frustration that we experienced a year before. Buy the gadget you’ve seen on TV 1000 times since September and hope it works. We purchased this item and put it to the test. Average cost for the LightKeeperPro.com is around $19.95. But then again what “As Seen on TV” item isn’t. The packaging explains a 3 easy step process. However, once you open it you are given a three page electrical guide of how to use the device, the theory behind the concept, and what not to do with the device. Of course, we opted for the video tutorials rather. Honestly, the video tutorials were very helpful. We’ve read instruction/watched the video. Know the functions of the device and are setting there with our first strand of broken lights. We opt to try process one which is simply pull a non working bulb out and stick the socket into the LightKeeper Pro and pull the trigger 7-30 times (yes we said 30 times). Fortunately, and to our amazement, the lights flashed on the third pull and the fourth pull the strand was lit. So SUCCESS! 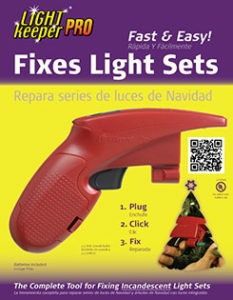 we managed to save about $7.95 (cost of a replacement string of lights) with this $20.00 tool. Granted had more strings of lights been out that would have been beneficial. The LightKeeper Pro has a built in voltage tester that also shows sheer broken wiring is. This is important because it’s not always just a burnt bulb. However, there’s no fixing a twisted or broken wire light set. It’s safer to simply replace the entire strand. OK ok ok… Does the LightKeeper Pro work already? In conclusion, does the LightKeeper Pro really work? In our experience, yes. The LightKeep Pro may also give one the since of accomplishment seeing the lights come back to life. Will someone save money using the LightKeeper Pro? Over many Christmases; possibly. However, newer technology LED lighted Christmas lights have already made the conventional LightKeeper Pro obsolete. Not to fear, they have an LED version for about the same price called the LED Keeper. All in all the device does work and has it’s uses. What is my best affordable option for Christmas Light Installation in Houston? Instead of fretting over tangled wires, call Houston-Luxury=Lighting at (713) 481-1518 and get your lights installed this week. We will make sure every bulb works, handle the installation and even remove and store the lights for next year. Spend the extra time with your family instead of frustrated by the non-working lights.